This marble board game has a teeter-tottering surface that lays an exciting, suspenseful foundation for play. 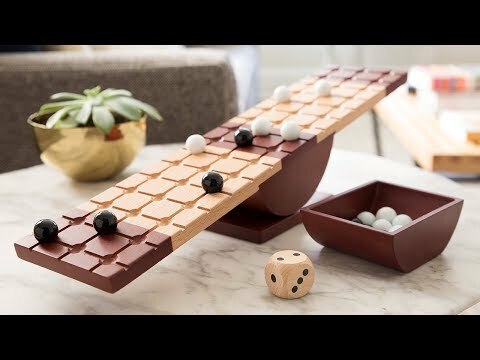 Win by getting all of your marbles to the end of the board or by tricking the other player into losing (aka: tipping the board so it touches the table). Dimensions: 3.5" x 16.8" x 4.13"
Any level can play and this is a fun game. Really fun. Simple but not. Lots of stagedy. This balancing-act of a marble board game is named after Archimedes, the famous Greek mathematician who discovered the laws of the lever. 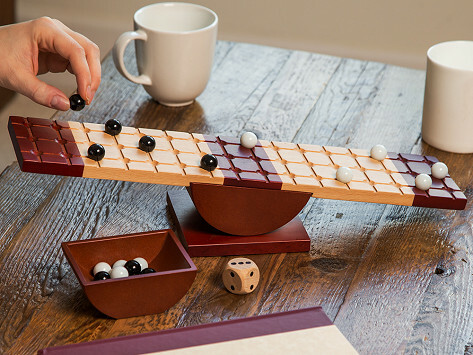 Rock Me Archimedes is made from beautiful beechwood and the game is half strategy, half luck. You win by getting all of your marbles to the end of the board or by tricking the other player into losing (aka: tipping the board so it touches the table). Sounds straightforward, right? Well, this is where the game gets interesting: the whole board sits on a teeter-tottering lever. You’ll have to be nimble and weigh your options on each turn. Either add a new marble to the middle of the board, or roll the die to move any existing pieces that number of spaces. When the game is over, Rock Me Archimedes’ unique wood design makes a great coffee table decoration until next time.